View from an observation hall at 45th fl. of Tokyo Metropolitan Government Bldg. Shinjuku Juniso Tennen Onsen located basement of marked bldg, lower right. If the sky was clear, Mt.Fuji might be seen in this photo. Are there any onsens in Tokyo? Yes, many! But you have to say goodbye to one of them soon. Shinjuku is known for one of the busiest area in Tokyo, and the Shinjuku Juniso Tennen Onsen（新宿十二社天然温泉） sits just few blocks away from Tokyo Metropolitan Government and Grand Hyatt Tokyo. It's going out of business on 29 March 2009, ending more than 50 years of history. This is the only onsen accepting visitors in Shinjuku-ward (Others are also onsens in condominium buildings, but open exclusively for the condo residents) . Heated bath. 43 degrees Celsius at my visit. The admission fee is rather expensive at JPY 1900. (Link to currency converter) It had been preventing me to visit there, but I didn't want to loose a chance to soak an only onsen available in this area, so I made a first and last visit the other day. Located basement of a condominium building, there are indoor baths only, no open air baths. The water is as dark as coke or coffee, you can see only few inches into the water from the surface. Keep in mind there are steps inside baths for sure. Why dark? Onsens in Tokyo are unrelated to volcanic activities, most of them are fossil seawater. Many are dark and cold. "Cold hot springs"? Yes, they are literary hot springs, but physically they aren't hot at all. 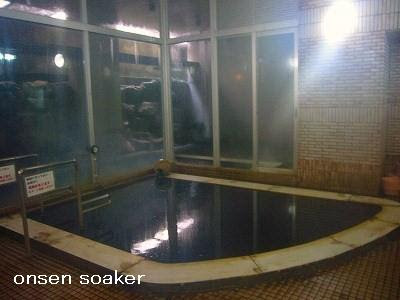 As for Shinjuku Juniso Tennen Onsen, it's 25.9 degrees Celsius at fountainhead. "L" shaped unheated bath was 21.8 degrees. The Hot Spring Law of Japan stipulates that if the temperature of specific water is more than 25 degrees Celsius at fountainhead, or if specific water contains certain amount of any of 19 kinds of minerals(sulfur, radon, lithium, barium, carbon dioxide, and so on) at fountainhead, it's certified as an onsen. It means cold mineral springs are also onsens, as long as they contain certain amount of those minerals. So there are many cold hot springs in Japan. Shinjuku Juniso Tennen Onsen applies hot spring by both of temperature and mineral component. 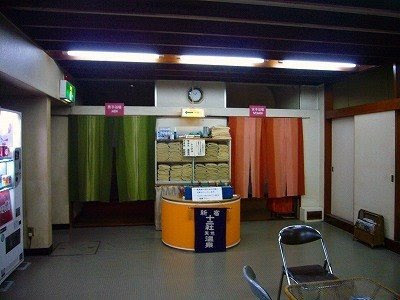 There are many cheaper "Sento" onsens in Tokyo and elswhere around Japan. Wait for information and photos. I will write an entry on Sento Onsen someday (may be not in near future). When it comes to the observation hall of Tokyo Metropolitan Government Bldg, it's open to the public everyday from 9:30 AM to 11:00 PM　(last entrance 10:30 PM) for free. There are north and south towers, and both or either of them would be open anyday. Entrance of changing rooms. Men to left, ladies to right. You are coming to Japan! Lucky guy! Cherry blossom will be in full bloom then. It takes about 15 minutes on foot from Shinjuku Station to the Onsen. Go out of the west exit of the station, then walk west toward outside of yamanote-line. There is an underground sidewalk. Find the Tokyo Metropolitan Government Building(Tocho) first. You can ask around "Tocho wa doko desuka?" everybody knows Tocho. Onsen is further west from the Tocho. There is a big park next to Tocho, then Onsen is next of the park. I am afraid not many people know there is an Onsen there. 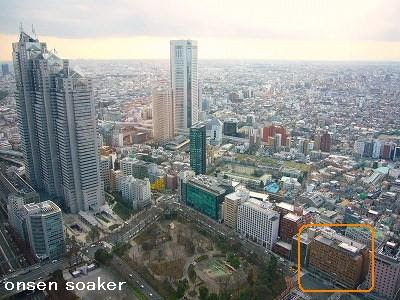 Onsen's address is 4-31-3, Nishishinjuku, Shinjuku-ku, Tokyo. For further info, please input follwing latitude and longitude on Google map or what ever online map you use. I hope you can make it. Good luck! 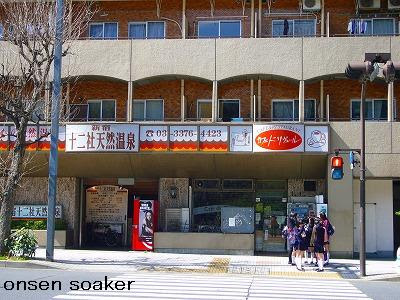 Thanks for all your help to find this onsen in Shinjuku. I would like to become a guy even more lucky if you would become my onsen guide for my march visit. I lived 3 1/2 years in Tokyo, and i have visited about 150 onsen during this time from Hokkaido to Kyuushu but most of them in Tochigi, Gumma, Nagano and central Japan . We could exchange our feelings about all the onsen we have visited, drinking a beer in an isakaya in Shinjuku. You could explain me what is the meaning for japanese people of "hadaka no tsukiai"
I am afraid I have appointments all weekends until Apr. 12. I couldn't change my schedule. 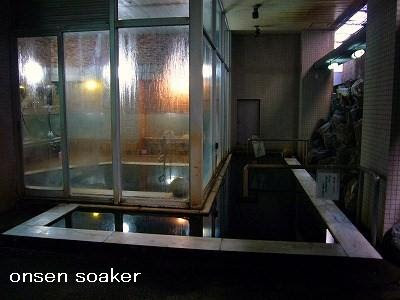 But if you need further information on this Shinuku Juniso Onsen or any other onsens in Japan, let me know. I will get information as much as possible and inform you. I hope you will enjoy all onsens you visit this time! Thanks onsen soaker for your help. Next time i come to Japan i will informe you well ahead to have a chance to fit in your bussy agenda. I will let you know my feelings after my visit to the Shinjuku Juniso Onsen. May i ask you the meaning of "hadaka no tsukiai"